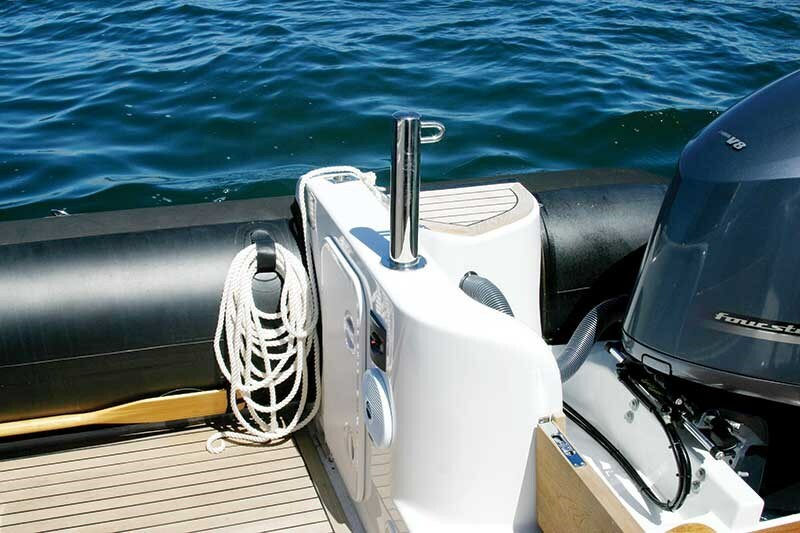 Rayglass’ Protector rigid hull inflatables (6.5m to 18m) are designed to handle harsh conditions. They are versatile vessels, and are highly regarded as work boats, particularly as tenders for events such as America’s Cup and the Louis Vuitton series. 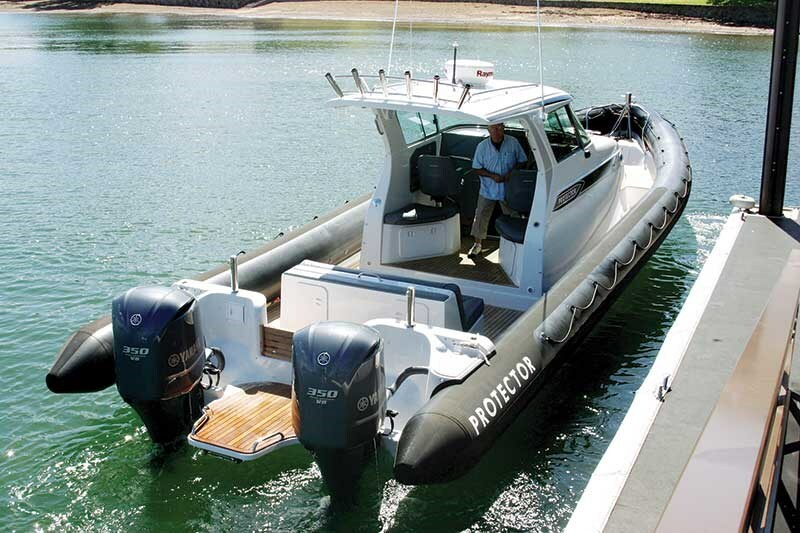 Large and stable with ample deck spaces for carrying mountains of gear and equipment used by the teams, they also serve as ideal tow boats for the yachts at the start and finish of a day’s racing or training, and for transferring crews and kit mid-ocean. So when someone wants a vessel that can handle harsh conditions, but also wants the full spectrum of family-oriented activities – wake boarding, water skiing or comfortable cruising, the custom Protector SL, built for all these requirements, is just the ticket. This sleek vessel offers an industrial pedigree, with large, black hypalon tubes that are both UV- and petroleum-resistant. Each is equipped with 12 separate chambers with individual valves, and grab rails that run lengthwise. Several heavy-duty Velcro straps forward and aft assist docking. 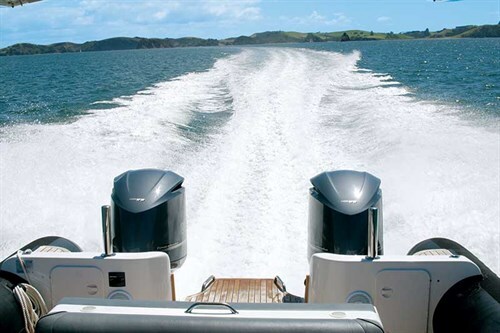 Noticeable, are two large powerplants snuggled up to the transom – a pair of Yamaha’s 5.3litre, 350hp V8s. They’re positioned further apart than a standard twin-rig configuration, which offers fine control on the boat at low and high speeds. Between the two outboards is an extended swim platform for divers, swimmers or skiers, meaning that entering or exiting from the water is a breeze. This boat is equipped for family fun, with two ski poles, positioned behind each outboard. Step aboard and you’ll be impressed by the huge cockpit area, with more than enough space for two or three families to enjoy the day. The transom’s packed with watertight storage, and supplemented by two, big gear lockers built into the hull. A large, movable sofa-style seat has additional lockers. 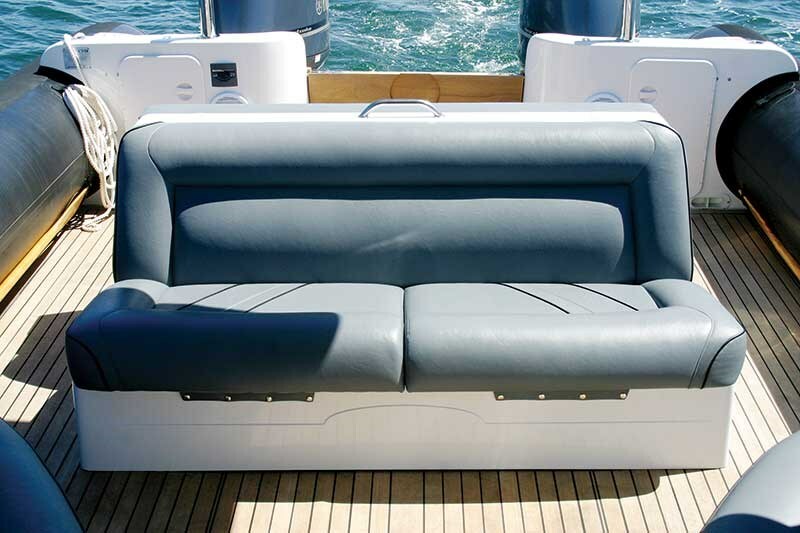 Fitted to the side of the cabin is a set of outrigger bases, and the lounge chair can be removed from the boat to reveal a flush-mounted game chair mount in the centre of the cockpit. This turns the vessel into a fast, stable inshore or offshore sport-fishing weapon. 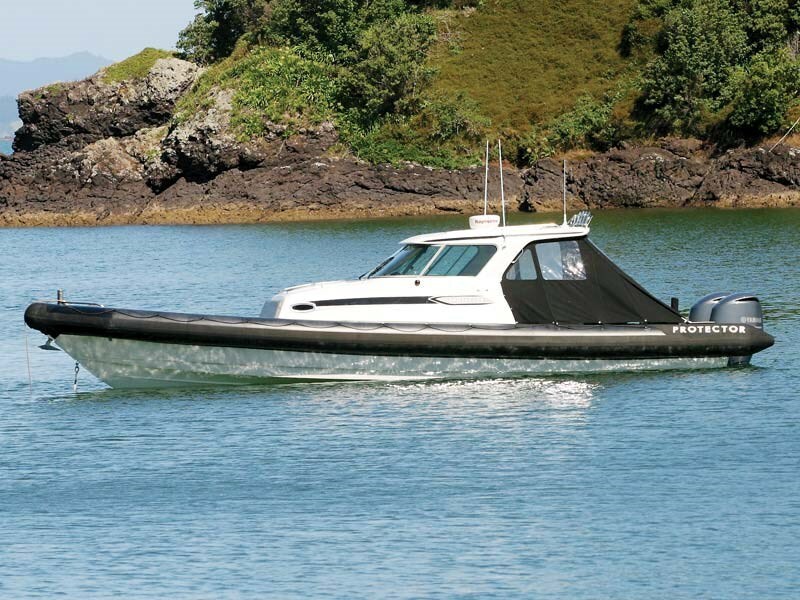 The review boat was the first of the larger Protectors with the cabin size and position adjusted to offer full walk-around capability – it’s great for getting to the bow area. The bow features a small, step-up platform with a large stainless bollard and storage locker for fenders, ropes, and a spare anchor. 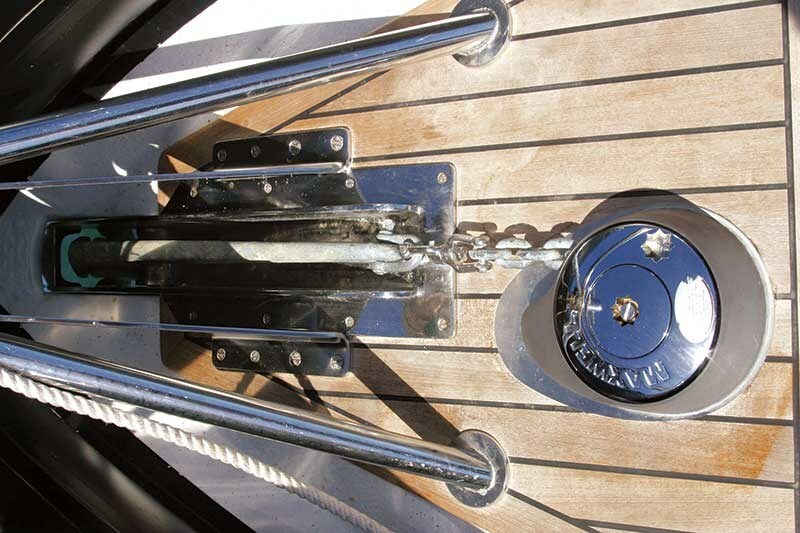 A neat Maxwell winch can be operated from the helm or the deck, and the anchor fairlead is neatly flush-mounted and fitted to the high part of the hull. This leaves good clearance from the hull itself, minimising possible gel-coat damage from an incorrectly secured anchor. 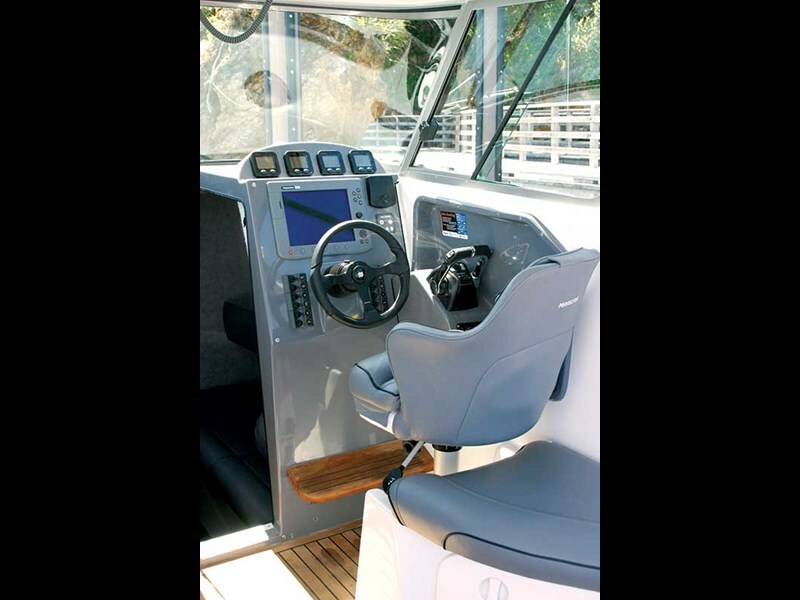 In the cabin and helm station are two rear-facing seats (port and starboard) behind the helm and main passenger seats which are both mounted on heavy-duty, gas-operated pedestals. The helm is loaded with the electronics flush-mounted into the dash. They include a multi-option sounder/GPS/radar, a set of electronic Yamaha engine management gauges, a VHF, stereo, and a switch panel. 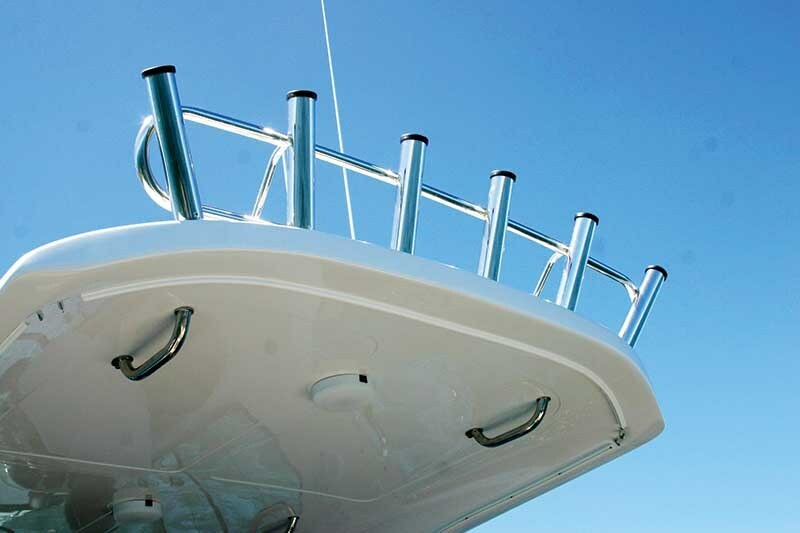 Throttles are handily located and easily operable from both standing and seated heights. Both helm and passenger seats have sliding windows for ventilation – definitely required on hot days. In the forecabin are two large squab seats – not ideal for lying fully stretched, but certainly comfortable enough for forty winks. Both squabs have good storage underneath for safety and wet weather gear. Neatly located behind the stairs is a fridge and further forward (behind a swing door) is a toilet and shower. This area has good head room. A large hatch in the ceiling provides ventilation. A nudge of bow thruster eased the bow from the jetty. A thruster is not really a necessity, but it’s a neat add-on, offering exceptional (and very simple) manoeuvrability for what is a substantial boat. We headed for the open ocean – north of the Bay of Islands. Electronic controls give good, positive response from the outboards. Their power and torque offer effortless performance, and we zipped past Black Rocks at 40mph (4100rpm). The vessel was approximately half full of fuel. Power steering provides an excellent, positive response in the helm, and even throwing it into hard turns, the Protector was easily handled and manoeuvred. The deep V and long chines dug in and provide full control in all movements. It’s a superb ride. 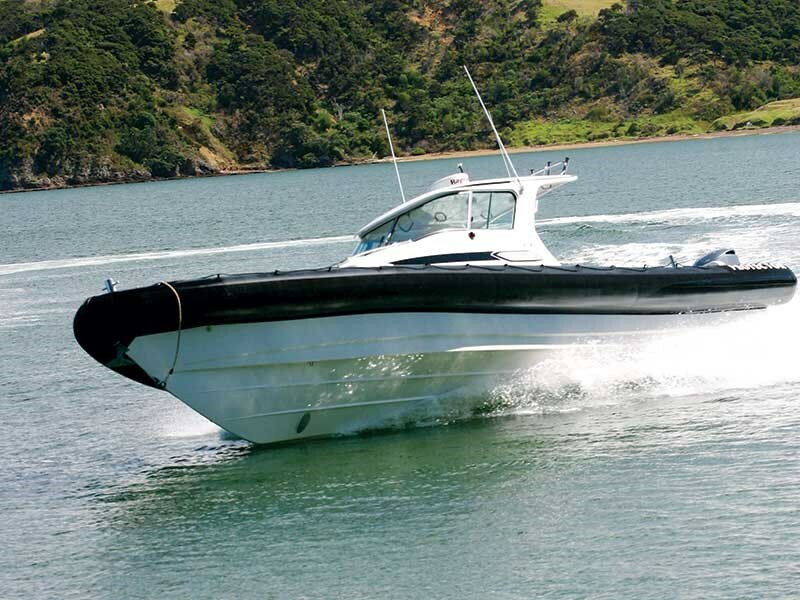 Fully wrung out on the lazy, half-metre swell, the RIB returned 85kph at 5600rpms – pretty swift for a 12.5m vessel weighing just on six tonne. For interests sake, at 4100rpm (65kph cruising speed!) the twin V8s are using around 164 litres/hour of fuel. With 1100 litres in the tank, that equates to fast, long distance runs to remote spots, giving you more fishing time when you get there. This style of boat may not be everyone’s cup of tea, but they have a lot going for them, especially if you are looking for an all-round safe boat. Key attractions include the vast amount of space for cruising or diving the coast with family and friends, or if fishing is your game, it’s a fast, manoeuvrable vessel that will get you to your favourite fishing spot in double-quick time. Ultimately, the boat is much like its name: it offers protection in harsh conditions and provides superior comfort and safe boating. Check out this short review of the Senator 440 (first published in 2006).